Front page of the Chicago Tribune, February 23, 2013. Not shown is the complete 2 page spread inside. As many of you know, we have had our own issues with USS. Having declined the option to skate with the USS program based in Salt Lake City, we have chosen to train with Nancy Sr. and receive little benefit but a season entrance pass to the rink. Yet, of course we still represent them in competition because we can't really be our own entity and then compete in international competitions. Yet, at this point we would prefer to represent just ourselves and our country. All we want is to be treated fairly and for the organization to acknowledge "Hey, you guys have be working your butts off over there, we don't have that much money at the moment but we care about you and we'll try to help you out in any way possible," and actually do it. But even though our 4x Olympian coach has trained many Olympians through the 80's, 90's and 00's, the organization ignores our existence unless we have results that get their attention and then, of course, they want the association. Our coach is not included in meetings, necessary information, and receives "No you cannot's" constantly. She is told that she will be treated like any other non-national team coach and that she's not good enough to create a medalist (which she's already done). She's also been criticized for not taking her skaters out to train in Salt Lake. Nancy Sr. is an Olympian, alumnus and present coach of Olympians. This is why USS has financial problems, membership problems, rebellion and little alumni support-because more was taken away from them than ever received. The way to get alumni to give back and help create financial solvency is to have supported them when they were skaters with confidence, trust, recognition, communication and finances if possible-um, no brainer! Instead, USS continues to take it for granted that Nancy Sr. continues to create Olympians with literally no sweat or money out off their back. In fact, along with offering little help, they actually make it more difficult for us. There are so many instances where we can describe unfair treatment towards us. They range from outright, disrespectful yelling at Nancy Sr. by USS coaches, staff, and a board member-all related to our trying to keep our autonomy and just being individuals doing it on our own-to seldom recognizing midwest skaters in the media and when they actually do, often accepting credit for their successes. They also inappropriately quote USS coaches names in media which misleadingly indicates that they are the coach of the privately-coached skater mentioned. One of our worst conflicts with USS, though, was in the Vancouver Olympics, when USS board members Jack Mortell and Brad Goskowitz took away an Olympic accreditation Nancy Sr. received from speedskating's international governing body (the ISU) to coach Nancy Jr. and Brian Hansen during their Olympic races. Leaving them with other USS coaches instead. They took away a skater's mother who was her coach at the Olympics! This was reported in the press but didn't get much attention. Instead, accreditations were given to a "team psychiatrist" whom few used, and other personal whom the USS deemed important. It's not that those people aren't potentially of value, but the power play to bar Nancy Sr. was a failing attempt to cover up internal fighting, little national team success and unprecedented private coaching success (yep, some other private coaches, Paul Marchese, Kip Carpenter and Tom Cushman had skaters in that Olympics too). Because of this, like after the 2006 Winter Olympics, a majority of USS adminstration got fired (though not Jack Mortell or Brad Goskowitz) but obviously, the problems remained. This is just one part of the bigger picture and I think it's pretty indicative of the history of this organization. But it's our story, and we will continue to train without much help of an organization. Honestly, since they are already uninvolved in our training, I don't think dissolving USS would affect us as much as "On Thin Ice" says. Otherwise, I think the only change that will work is one that starts in the heart and honesty that starts at the top and spreads throughout the rest of the organization. It can happen. But when Jack Mortell says in this Tribune report that "you can paint me any way you want, my job is to win Olympic medals," he is minimizing the destruction caused by his insatiable control over the organization by upstaging it with our country's love of the Olympic medal and him being the deliverer. Unbelievable. Is he the one that hits the gym and the rink to train his tail off just to have a chance to make an Olympic team? Last time I checked, it was the skater's job to win the medals and USS's job to help us out. Jack should realize that he needs to invest in developing skaters from grassroots programs all over the US as well as the top skaters to ensure future success of our speedskaters-a dying breed of US athletes. 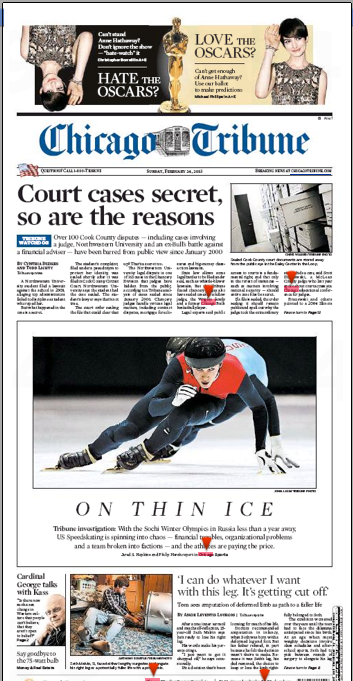 "Talent Pool In Long Track Could Be Drying Up"
A later article written March 5th, 2013, in the Chicago Tribune that says 6 speedskaters recently filed an official complaint to the USOC (which isn't unusual) and demands reorganization and a new CEO. "6 skaters demand USS Speedskating reorganization"
Coach is Back in the Game!